5 Star Saddle Pads are made with natural, 100% pure wool fibers with absolutely NO REUSED/RECOMBED OR SYNTHETIC FIBERS blended into the 5 Star felt. 5 Star Saddle Pads give you 4X more wicking ability which removes more moisture (sweat) and heat from your horse’s back during your rides. 2. You have a saddle on top of the pad that will prevent a 100% release of this heat and moisture build up during your ride. In order for your 5 Star Pad to finish the “breathing out” or release process of the heat and moisture that it has wicked or “breathed in” during your long ride, it must have the opportunity to finish this “breathing out” or release process after the ride. 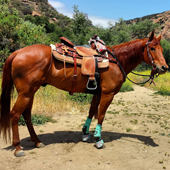 Continuing this process after riding, will allow your 5 Star Pad the ability to wick sweat and remove heat day after day and allow a long and productive pad life that will continue to give your horse the protection he needs and deserves. To continue the breathing out or release process, it is VERY IMPORTANT to properly air dry the 5 Star Pad after each ride!!! Air dry outside in the sun if possible or in a well ventilated area with plenty of air flow around the pad. Never air dry a 5 Star Pad laying on its back. 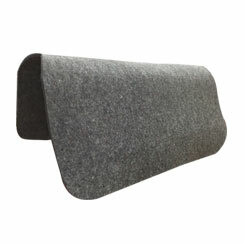 Air dry a 5 Star Pad on a rail or hang it up by the gullet hole. 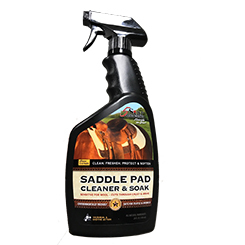 When air drying a wet 5 star Pad, it is a must that the bottom of the pad is exposed to dry air flow so that it will be able to continue the release process of moisture and heat to the opposite or top side of the saddle pad. 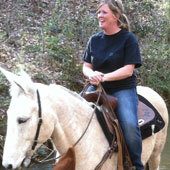 This is why it is crucial that you do not store anything on top of the saddle pad during this air drying process. 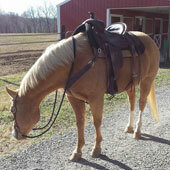 This will allow breathing out (release) a chance to move the moisture and heat out through the top of the saddle pad. If possible for daily rides, have a 2nd 5 Star pad for day 2 to alternate pads out. This allows the 1st pad’s wool fibers a chance to completely release and dry out. WARNING: If you live in the southern US or in a region where there is high heat and humidity, it is very important that you follow the washing, air drying and storing instructions. We have customers in these areas having issues with their pads, because the pads are not being washed, air dried and stored properly. When the pads are not dried and stored correctly, the breathing process cannot finish the release of the heat and moisture from within the 100% wool fibers. 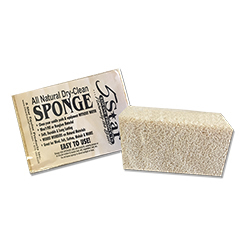 Wash pads with luke warm water or with a PH neutral soap. The warm water will allow the fibers to open up and release salt, sweat and dirt so that the natural fibers can breathe. Washing intervals should be every 40-50 hours of use! Wool fibers breathe in (wick sweat) and breathe out (releases moisture), but for the process to work at its optimal ability, the 100% wool pad needs to be air dried so that it can breathe out (release) the moisture trapped inside the fibers. Breathability is key during and after riding! Never store in an air tight space – be sure you store a 5 Star Pad in a well ventilated area. 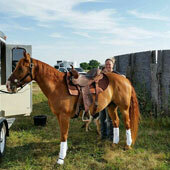 Do not store in extremely hot enclosed areas such as a tack compartment in your horse trailer. Never store a 5 Star Pad on its back. 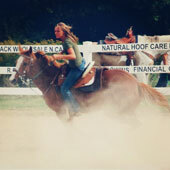 Always store a 5 Star Pad on a rail, saddle rack, or saddle pad bar. It can also be hung by the gullet hole for storage. Never store a pad while it is still wet. Never store a 5 Star Pad with anything on top of it. 5 Star Pads are always breathing, therefore they need to be stored so that nothing can hinder the drying process after riding or washing. Do not store a 5 Star Pad inside of a plastic bag. If these steps are not adhered to for a 5 Star Pad, the pad can begin to rot and disintegrate. If 5 Star Pads are not properly cared for as outline from the very beginning of its use, we cannot stand behind the product. These steps of care are much more critical if the pad customer lives in the southern US or anywhere the temperature and humidity are considered high during the majority of the year. We know if the pad has been properly cared for and washed (no pressure washing) and properly air dried. These pads will last 2,000 plus hours with all of the protection that they have when they are purchased new. We recommend that you never store 5 Star Pads in an air tight storage tack room or hot air tight tack compartment in a horse trailer. Storage of pads works best where air can move at all times. Pads should be stored in a well ventilated area so they can breathe and release moisture. Never store 5 Star Pads with anything on top of the pad that will prevent proper breathing while drying whether drying sweat from a day of riding of drying after being properly washed.